State representatives will be chosen based on their research and publications and involvement in Orthopaedic Academic Research. 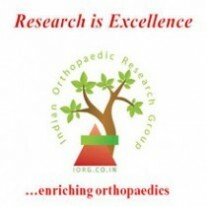 The role of State representatives will be in spreading the ideology of Indian Orthopaedic Research group. They will represent IORG at state level and will co-ordinate the activities like workshops and certificate courses. Together this will form a strong network which will forge the begening of a new era in Indian Orthopaedic Academic Research. We wish to have surgeons who are really interested and will like to make a difference for indian Orthopaedics. A high degree of dedication will be expected and only that will help in furthering the goals of IORG. State representatives will have a term of 2 years after which they will be included in the IORG State councils. Please Apply with your updated CV clearly mentioning the current appointment, degree with year of passing and institute of passing, number of papers, presentations and a small paragraph on why do they wish to join the IORG. We have already received application from our last announcement and surgeon who have already applied need not apply again, however if they have some new publication or presentations, they can apply again.